The freestanding tub is an island of serenity in the master bathroom, with plenty of natural light reflecting off of the herringbone-pattered tile floor. A mosaic wall in the guest shower picks up the texture theme. Reflective materials give the smallish master bathroom a sense of space. A raised base conceals the plumbing for the master bath’s oversize freestanding tub. The polished wood vanity top in the guest bathroom is a rare irregular shape in the home. “You never see a bookcase in a bath, that’s why we love it,” says Josh Linder about the master bath’s photo. Green-as-malachite wallpaper revs up the powder room. An Empire tub, grounded by a herringbone tile floor, is the centerpiece of the master bathroom. A faux bois mirror in the powder room is the perfect partner to the Tropical Isle wallpaper from Schumacher. A bedroom was converted into a master bath, complete with mosaic marble floors and medicine cabinets framed with trim that mimics the home’s window casings. Agate sconces illuminate the powder room under the stairs. Duffy designed the master bath’s teak vanity with room to store towels and toiletries. The master bath was reconfigured and updated with a custom double vanity. Kelly Wearstler wallpaper creates a vibrant mood in the powder room. Porcelain hardwood tile meets stone shower tile for a serene master bathroom. Open shelving, boldly patterned floor tiles, and a custom shower curtain lend fun and practicality to the kids’ Jack-and-Jill bathroom. The tub is new, as is the pendant light—one of the few contemporary fixtures in the house. In the expanded downstairs bath, an old dresser was turned into a vanity with the faucet mounted on the wall to provide more depth for the sink. A deep Fleurco tub in the master bath promotes relaxing. The master bath is one of the few rooms where curtains were used, softening the windows while imparting a sense of privacy. Polished tile and marble make for a glamorous bathroom. The master bath, created post-fire by reconfiguring the floor plan just a bit, is a dream come true for Ashley. All the bathrooms adhere to a serene neutral palette. The wife’s bathroom vanity is flanked by frosted-glass partitions enclosing the toilet and shower. The latter doesn’t get much use, thanks to the elliptical tub overlooking the dunes and ocean; the shiplap ceiling above falls short of the walls, so it appears to float. The master bath includes a handcrafted Japanese-inspired teak soaking tub, heated slate floors, and custom cabinetry. Aqua Ann Sacks oversize glass subway tiles form the backsplash in the master bathroom. The powder room is painted with Farrow & Ball’s Off-Black, a stark exception to the “white walls only” rule throughout the home. The white lacquered drawers and door of a vanity in the master bath tuck into an alabaster frame. The first-floor powder room’s mahogany vanity and wood veneer–clad walls are examples of the home’s eclectic design. The existing master bath was gutted and enlarged to make way for the spacious marble-tiled shower. The penny-round tile in the master bath is the gray-blue of the ocean on a cloudy day. Wallpaper with an ikat-inspired design picks up the diamond-shaped details of the reproduction vanity in the first-floor powder room. A reproduction of a vintage bronze tub sits atop painted wooden tiles in a first-floor bath. Beaded white wallpaper in the powder room shimmers gently at night. Waterworks, in Westport, was the source of the contemporary furnishings in the spacious master bath builder Chris Washington carved out of the original master bedroom. A once-dark powder room got a light and bright makeover with Gracie wallpaper, marble floor tile, and a lighter-than-air Lucite vanity from Waterworks. Classic but understated, the husband’s bath features marble tile walls and a custom vanity. On the first floor, the elegant guest bath features a custom granite sink and a generous frosted-glass shower enclosure. She also designed the main bathroom’s generous marble-topped vanity, crafted by cabinetmaker David Bowen. In the bath, a large soaking tub stands before double windows peering over the gardens. The powder room’s sculptural concrete sink partners with another of Adelman’s light fixtures. In the master bath, custom wood millwork embellishes the concrete trough sink and warms the room’s pale palette. Wainscoting of Italian tile adorns the niche that holds the new freestanding tub. The powder room features custom wallpaper with the text of an ancient Greek letter hand-illustrated by Brooklyn artist Katie Merz. Horn-and-bone mirrors enliven the master bath’s Restoration Hardware vanity. A stone backed sculptural tub. Discreet LED lighting helps underscore the master bath’s quality craftsmanship, which includes a double vanity spanning the entire length of the wall. The powder room features a Corian sink, also designed by Perez, backed with Fantasy Black Quartzite. The master bath’s indoor shower connects to its outdoor counterpart. One of two matching vanities in the master bath; the wire bases are former flower displays. A Victoria + Albert soaking tub in the master bathroom sits between a pair of vanities topped in mitered Carrara stone. The clean and serene master bath features a floor-to-ceiling window and maple cabinetry. Sandberg wallpaper from Stark graces a guest bath. A soaking tub nestles between shiplap walls in the master bath. A guest bathroom continues the sleek lines and neutral palette of the house. The compact powder room off the dining room features a custom triangular sink crafted from limestone. A Wetstyle tub in the master bath overlooks scrub-covered dunes and the bay beyond. The guest room’s washstand was made in England. A fish-themed mosaic floor and a porthole window give the master bath nautical flair. Custom shades from Blanche P. Field finesse the powder room sconces. The sculptural tub in the master bath is tucked into its own cozy alcove with a close-up look at the outdoors. In the master bath, a nineteenth-century French gilt-bronze and crystal chandelier adds a bit of whimsy to the sleek marble and polished-nickel fixtures. An original wooden beam highlights the expanse of new windows. In the first-floor powder room the original beadboard ceiling contrasts nicely with a vintage mirror and modern sconces. A generous swath of pale marble guarantees a pristine look for the owner’s bath. In a tiny powder room near the entry, streamlined wallpaper, a sleek mirror, and a contemporary vanity keep the space from feeling cluttered. A mix of materials and textures, all in the palest of hues, creates a restful master bath. Marble tiles in a calming wave design cover the end wall of the husband’s bath. The powder room is clad in a Phillip Jeffries wallcovering. The Briolette Glass vessel sink atop the painted vanity is by Kohler. Function melds with fashion in an adjacent powder room, where exterior shingles and floors of repurposed terracotta roof tiles blend indoors and out. The master bath’s floor, shower walls, and tub surround are an amalgam of different cuts and shapes from the same slab of marble, adding yet another layer of interest. In the powder room just off the kitchen, a deep, vibrant blue on the mirror, sconces, and vanity is a nice variation from the muted blue tones throughout the rest of the home. A framed vintage subway sign announces the couple’s Boston roots. The bathroom is a work of art itself, boasting a sink with a faucet that extends from the ceiling and mirrored walls for extra sparkle. The spa-like master bath is a study in simplicity. Glamour reigns in a powder room. A faux zebra rug by Jonathan Adler warms the classically tiled floor in the master bath. The to-die-for tub has a center drain and a side overflow, which demanded specialized plumbing. A bathroom was designed for easy care and timeless good looks. The master bath is simple and elegant, a vision in white. The classic trellis design of the Zoffany wallpaper and the handsome Barclay sink bring personality to the powder room. A raised tub and lots of windows turn the master bath into a lofty oasis. The watery motif of the home extends into the spa-like master bath; the custom cabinetry is from Downsview of Boston. The master bath offers luxurious serenity. In the master bath, the husband’s grooming area includes pendants from Visual Comfort, sconces by Robert Abbey, and an antique slipper chair. The bathroom off the pool room is marked by cheerful tile in a fun pattern. An undulating wall of tile behind the tub in the master bath mimics rippling water. Plush sheepskin rugs from Overland warm the master bath. A sink base picked up at the antiques show in Brimfield, Massachusetts, finds a new home in the first-floor powder room. The master bath tub sits in a nook with views of a pond. The tub in the master bathroom offers harbor views. A heated marble floor ups the master bathâs comfort level. The master bathroom has a soothing palette of cream, grey, and white. Simple tile and clean whites make for a fuss-free master bath that doesnât skimp on luxury. A Restoration Hardware vanity resembles a piece of furniture, perfectly fitting its niche in the guest bathroom. Capiz-shell tiles create a special feature wall in the powder room. Beauty and drama merge in the master bathroom, where an egg-shaped sink rests atop live-edge, locally sourced cherry wood. Samimi-Urich chose the smoked-glass pendants because they suggest drops of water. The walls of a small powder room wear colorful tiles and Trove’s picturesque Fuoco wallcovering. A set of Vaughan sconces and a stylish mirror pick up on the faux-bois wallpaper in the powder room. The same plaid fabric adds a note of color to the master bath. The Lio wall sconces in the master bath are by -Vistosi. Birkerts had the curtain made from Knoll Luxe’s -Millicent drapery fabric. The floor of the master bath, fabricated from Thassos and statuary Carrara marbles, is designed to look like a garden path; the beautiful collection of botanical photos reinforces the theme. Mirrored drawers and cabinet doors play up the substantial light that spills through the master bathroom windows. A farmer’s sink is a practical addition to the mudroom. A giant ikat print wallcovering flows around the first-floor powder room’s charming oval window. A black-and-white palette streamlines the compact powder room. The elegant powder room is swathed in blue floral fabrics. âI wanted to make it a jewel box,â says Griffin-Balsbaugh. A powder room holds a custom vanity. Beneath the ancient beams: a gleaming white marble bath. Strips of iridescent glass tile shimmer against white granite in the bathroom. The master bath features a large oval tub by Oceania. Refined simplicity in the master bath. The serene master bath boasts twin floating vanities and mirrored cabinets against Ann Sacks matchstick tiles framed in darker stone. Stone walls and floors wrap a powder room. The octagonal tower holds the master bath; glass partitions separate the oval tub from the vanity area. The guest bath takes a dramatic turn with horizontal wallpaper and a black-and-white striped rug. The master bath's octagonal recessed ceiling is accented by a fixture from Ailanthus. Custom vanities offer ample master bath storage. A large crystal chandelier sparkles against the powder room’s red walls. Faux Carrara wall and floor tile wraps the master bathroom. Waterworks fixtures dress up the gentlemanly master bathroom. Custom glass countertops dress the guest bath Restoration Hardware vanities. A sycamore vanity rests on limestone tile floors in the serene master bath. Silk wallcovering and mosaic tiles make the spa-like master bathroom a luxurious retreat. In the powder room, a Venetian mirror, slender lamp and ceramic dog add scale to what might otherwise be a forgettable space. A textured paper lends a three-dimensional effect to the powder roomâs wall. In the posh master bath, honed Carrara marble countertops and polished nickel hardware give the custom vanities an added dash of elegance. The curved fronts of the master bathroomâs vanities make it easy to lean into the mirror while shaving or applying makeup. Emerald-green grasscloth complements a painting reflected in a powder room mirror. 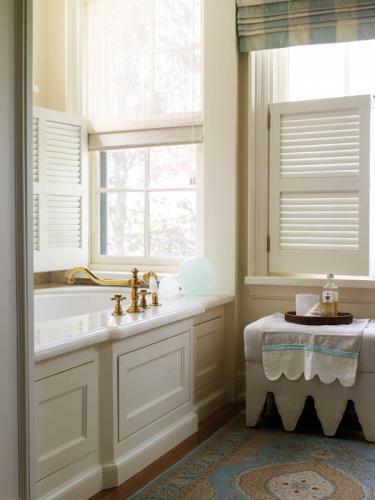 The master bath’s plantation shutters offer peek-a-boo views of the homeâs lush surroundings. His-and-her sinks and mirrors come with plenty of built-in storage space. Violet pops against pristine white in the master bath. An an aged-look mirror from Restoration Hardware and a new marble top for the vanity enliven the existing tile in the master bath. The tub in the master bath rests on a sea of smooth stones. Simple sheers at the windows give the spacious master bath privacy. "There’s something about a summer breeze gently moving sheers that says relax and take it easy for me," says Gauthier. In the owner’s paneled bedroom, an antique bow-front chest serves as a nightstand beside the dark-framed bed. Hand-picked marble slabs surround the tub and line the shower in the master bath. Like many rooms in the six-bedroom house, the master bath offers great views of the pond and the ocean. A glass slider separates indoor and outdoor showers in the master bath. White marble and linens foster a sense of airiness and light in the master bath, which puts the focus on the surroundings, too, with its generous window. The slipper tub was added to the small master bath. A powder room goes glamorous with reflective wallpaper. "Bubble baths revive me," says the designer, praising her master bath with its smart black-and-white theme. Schumacher’s Imperial Trellis lines the powder room’s walls. In the master bath, a model of sleek efficiency, a relaxing soak comes with a 270-degree view. One of the new additions holds the master suite with its luxe bath. The homeowner experimented with color in the baths, like the rich Drawing Room Blue from Farrow & Ball in this space. A tub enjoys dramatic views and its own proscenium arch. Reddish ipe wood meets pale onyx tile in an easy balance of rich materials and a contemporary feel in the master bath. The skylight in the master bath floor, set with etched glass for privacy, illuminates a staircase below. In the master suite, a sofa and wing chair provide inviting roosts, while an antique chest serves as a put-your-feet-up coffee table. A Schumacher grasscloth with a Greek key design adds drama to the first-floor powder room. A marble-topped vanity, one of two in the master bath, is designed to look like a piece of furniture. The master bathroom, paved in honed Carrara marble tiles, has an oversize shower and generous soaking tub. A hand-forged chandelier and sconces by Laura Lee Designs and a cache of shapely animal horns bring another layer of interest to the sunny master bath. Sheers separate the master bath’s mosaic standing tub from the views of Greenwich cove and Long Island Sound. The master bath also has a tropical feel, thanks to the aqua-and-white palette and a chandelier of Indonesian capiz shells. Wallpaper with a birch motif gives the downstairs powder room its woodsy feel. Neutral tones are a quiet, calming palette for the master bath. The dark wood of the vanity pops against pale travertine walls and floors in the master bath. The spa-like shower is sheathed in a mosaic of tumbled Carrara marble. "To me it’s like a Roman bath," says Richard Baiano. In the show-stopping master bath, the walls are crafted of wide slabs of marble that are perfectly book-matched to appear seamless. The same marble was used for the shelving and, cut into strips and laid in a herringbone pattern, on the floor. Sconces from Circa Lighting and a sculpture from Marc Hall Objekt add the finishing touches. 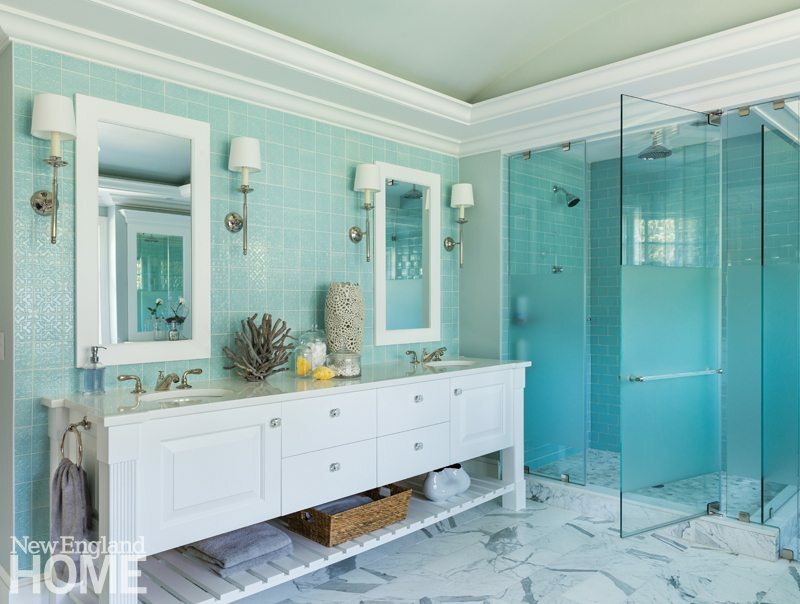 Breezy blues and snowy whites give the master bath and shower their spa-like feel. Lights mounted on the mirror illuminate Kara’s makeup table in the master bath. Even the master bath offers a view. The master bathroom takes a more serene tone with a floating teak vanity and large soaking tub. The couple’s vintage-style tub makes the most of the leafy views. "The owners wanted a soaking tub, but not one that was overly modern," explains Langlois. Two patterned wallpapers dress up the powder room. Dual sinks add to the convenience and aesthetic of the bath. The owners spotted the tub-a solid piece of Carrara marble-in a showroom north of Boston. "I took my shoes off and got right in it," says the wife. "It was important that it be comfortable." The black-lacquered powder room takes its cues from a chinoiserie painted chest the homeowner found and that interior designer Cindy Rinfret turned into a vanity. The couple’s shower is clad in stone tile from Artistic Tile’s Ambra Collection. A vaulted ceiling above the tub in the master bath is one more example of the skillful architects’ attention to details. Open shelves house towels, and marble in the tub surround and counter lends a note of elegance. Nestled into the hill and oriented toward the water, the house is mostly hidden from town despite being in the middle of it. The landscape plan is lush and natural looking. The master bath is awash in calming white. The powder room fairly glows, thanks to the tortoise-shell glass wall tiles, a Romanesque-inspired vanity with white Carrara top, and spun-glass vessel sink. Cedar walls, floor, and ceiling give a guest bath a Zen-like tranquility. The silver prints in the charmingly retro bath are by New Milford artist and decorator Ron Norsworthy. Natural light makes the master bath’s pale floor and walls luminous. The powder room’s razzle-dazzle wallpaper riffs on all the colors the designer incorporated in her scheme and simultaneously bestows big personality on a compact space. Light and dark materials take turns in the master bath. Clean lines and modern fixtures define the guest bath. The master bath incorporates a sculptural tub and limestone floor.